In December 2016, we asked the Universal Outreach community to give the gift of beekeeping. Three months later and the our beekeeping team was on the road to south-east Liberia to train a community to beekeep. Enjoy this story from Cecil Wilson, Universal Outreach’s Country Coordinator and head of the Beekeeping Extension Team, as he tells you about his journey into south-east Liberia and meeting some of Liberia’s infamous honey hunters. “When we arrived in the village, community members lingered close by with great expectation. They’ve heard about improved beekeeping practices and many times both government and NGO’s have promised to train them, but never have those promises materialized. This community is noted for having the most fruitful and brave honey hunters in Liberia. When they were told that the Universal Outreach would help them with training and starter kits, it seems like one of the many promises they received in the past. Now the vehicles were coming into their village full of beekeeping supplies. At this point it seems like a dream to them. Some skeptical people thought that we had come to draw honey from their rich forest where thousands of Kola trees mingle with other forest trees, for our personal gain, but soon enough we knew they would realize our team was set to deliver a beekeeping program unlike any other they have ever seen and dispel their concerns about potential ulterior motives behind our presence. The training goal was to construct sixty beehives for twenty participants, supply them with hive management knowledge, honey extraction equipment and also a year of intensive extension support for as long as they remain committed to beekeeping’s best practices. They are also going to receive top dollar for their honey when harvest comes. On the first day of the workshop, the venue was stormed with more then forty people seeking to be admitted into the training hall, but—as the nature of our program is—knowledge is available for those who see the value, so we allow all interested persons to sit and drink from the facilitators. The Universal Outreach facilitators have been trained to help people seeking to jump out of poverty and move up the economic ladder to a life where they have a better influence over the direction their children’s lives take. Up until this point this community generates its income from farming, a little hunting and honey hunting. Precisely forty-two people went through the training, but at the end only the targeted twenty persons received beehives. The other inputs such as beekeeping suits and harvest equipment will be shared on an “as per needed “basis. They were also told that the extra people who were allowed to sit in on the workshop will receive our extension support if they take the initiative to build their own hives. This was also the first workshop in which participants elected a person who did not receive beehives to be their chairperson. To our surprise he went on to start the construction of sixty hives in the month following the training—a sign of true resilience! A host family was secured for Maima and she was able to go to the United States for treatment. She had a successful surgery and returned to Liberia after a three month recovery period. Thanks to Children’s Medical Mission West, Dr. Zebovitz and the Pluta family for making this a reality. Maima is a young girl from the small town of Royesville, Liberia, West Africa. As many of you know, Royesville is where in 2009, Universal Outreach started a school building project and has been invested in the community ever since. Two years ago it was identified that Maima has a serious issue with her jaw that makes it impossible for her to open her mouth more than a few centimeters. After long struggles to find a solution in Liberia’s overwhelmed medical system, she traveled to neighbouring Ghana for a CT scan. The CT scan was immediately sent to Children’s Medical Mission West, a charitable organization that focuses on medical emergencies. A doctor in Maryland has been found who is willing to provide her free medical care for her Bilateral Temporomandibular Joint Boney Ankylosis, a condition that restricts her ability to open her mouth and has endangered her health. This medical solution will win Maima a new lease on life that her family could otherwise never afford. While her medical and transport costs are all covered,we still need to find an Annapolis-area family to volunteer to house herwhile she is undergoing her surgeries and follow-up care over the course of six to twelve months. Hosting Maima would be an outstanding cultural experience for an American family. Liberia became a homeland for freed American slaves, giving Liberia and the United States a long-standing bond that Maima’s country and its people treasure. 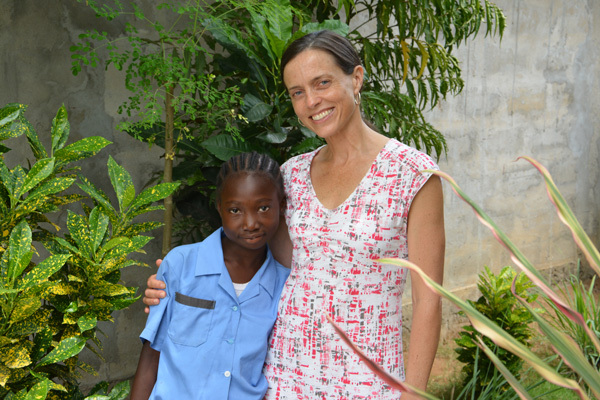 By hosting her, a family can explore the cultural bridges between Liberia and the United States, learn the subtle differences between Liberian English and the English spoken in North America, provide a miracle for a country with limited medical capacity, and change the life of a child in need. To learn more about Maima, please contact Landis Wyatt; to learn about the role of a host family and the screening process to ensure a safe and comforting placement, please contact Tami Shobe. Thanks for taking the time to read about Maima, and please share her story with your friends in the Annapolis area! Maima is one of those kids that can eat an incredible amount of food. Last time we ate lunch together I was sure to order her pepper soup; one of the biggest meals on the menu. It’s a small mountain of food with one bowl housing about four cups of rice and a second bowl overflowing with a peppery broth containing every kind of meat and fish you can think of —the perfect meal for this growing girl’s vivacious appetite. As we both started mining away at our ridiculously large lunches I was curious to see how Maima would tackle it. You see, Maima has a serious disadvantage when it comes to eating these days— she can only open her mouth three millimeters wide. This is the side effect of an illness Maima contacted when she was nine-years old. I didn’t know Maima when she first got sick, but by the time I met her she had severe swelling in her lower face and the infection was draining out of four exit points in her jaw. Her mouth was already locked shut, but thanks to two molars that had recently fallen out she had a few convenient spots to insert food through. This year those molars have filled in. On the day of our pepper soup lunch Maima had to focus on eating the soft foods that she could squeeze through the narrow opening. When she eats she does a subtle rolling action with her lips to help slip the food under her front teeth— it doesn’t look easy. I’ve been working on getting help for Maima for over a year now, but it’s been a slow process. We’ve gone to see a few specialists that were passing through Liberia, but a definitive diagnosis was never given. Fortunately a local doctor was able to get the infection under control and Maima made it through her most vulnerable moments. Now that Liberia has been declared Ebola free, Maima has renewed hope. Thanks to a kind doctor with the UN, Maima now has a complete medical history of her illness compiled in a paper and electronic format. I have also managed to develop a connection with an organization that does medical missions and there is a distinct possibility that a surgeon in the United States might be able to help her. Before my new lead will consider Maima’s case they need to see a CT scan. Since Liberia’s medical system can’t provide this we have to send her to Ghana to get the image done. Just this week I got a referral to a hospital in Accra, so I’m currently working on getting the appointment organized and arranging for her passport. Think about all those times when you’ve had a head cold and you wake up in the night with your mouth wide open because you can’t breath through your nose. Take a moment right now and allow your jaw to open just a tiny bit then try to breath out of your mouth—it’s not pleasant. Maima and her aunt are keen to sort this out, so I’m going to continue to do what I can. I’m still not sure if Maima is going to get the help she needs, but after a year and a half of trying I finally feel like we have some momentum. Maima would be grateful for a few positive thoughts and prayers right now and since I happen to be tapped in to the most amazing group of kind-hearted people I thought I pass along her request. If we all focus on Maima getting well perhaps it really will happen.